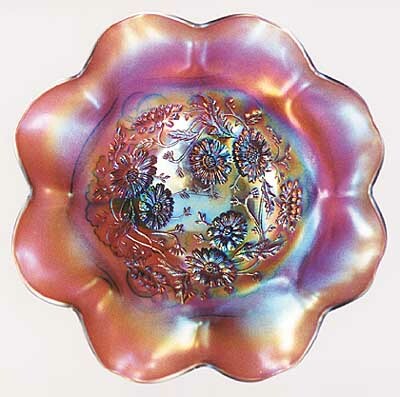 According to Dean and Diane Fry, there are only two of the ruffled bowls known. They were named after Linn Lewis who uncovered the first one in the early 1990s. They're 8 1/2 inches in diameter and have Northwood's Ruffles and Rings exterior. One of these sold at an auction in 2000 for $2,000. Photo courtesy of Dean and Diane Fry.